All that precision equipment and a CLAW HAMMER Noooooo! Got an afternoon in the garage! 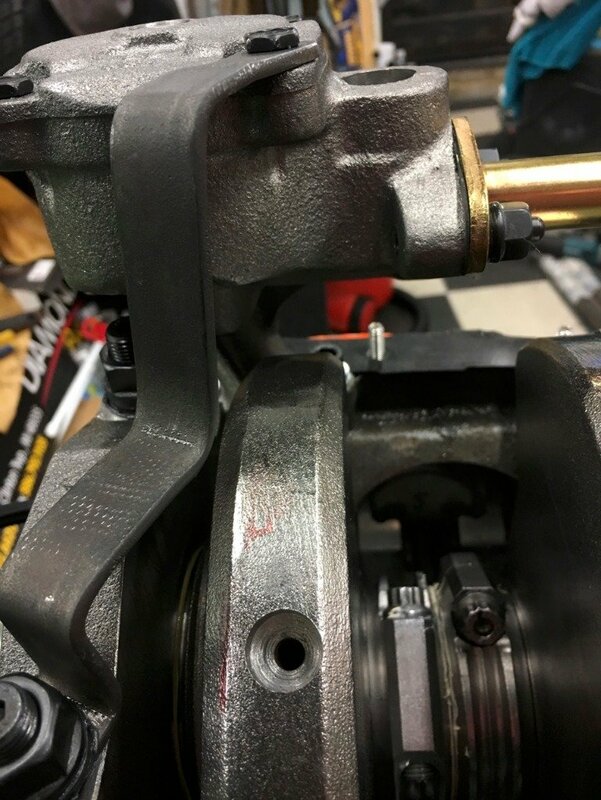 Fabricated the brace for the oil pump. All fits nicely. Fitted pan gasket and checked distance to bottom of oil pickup. 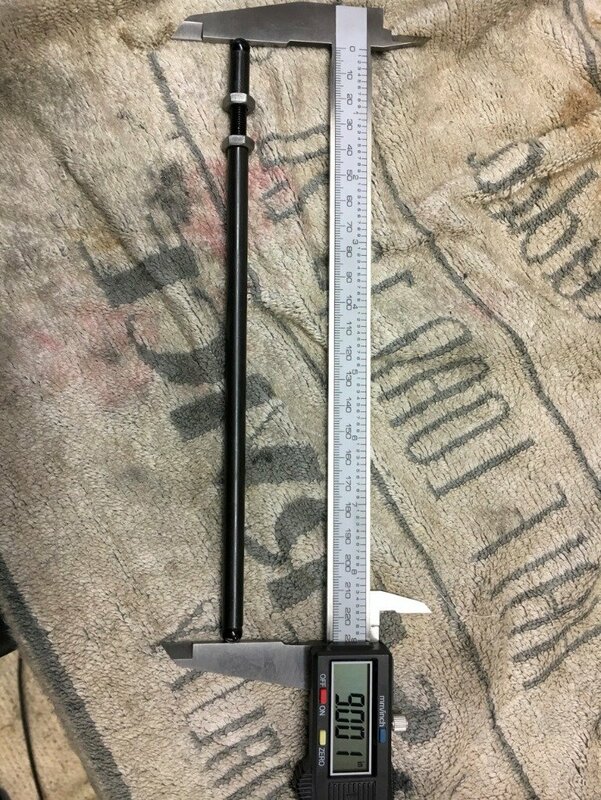 Got just under 7 1/2". 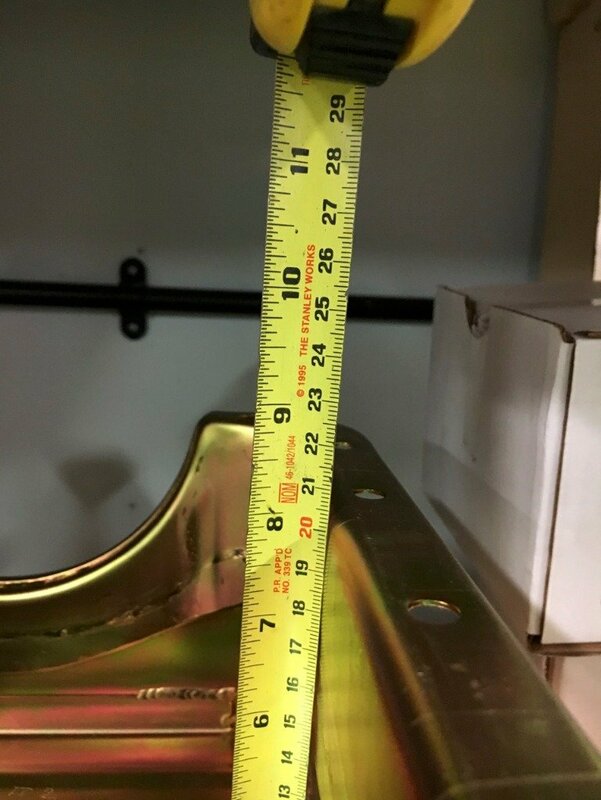 Camera angle makes it look closer to 7 1/4"
Checked depth of oil pan 8". So around 1\2" clearance between pick up and bottom of oil pan. 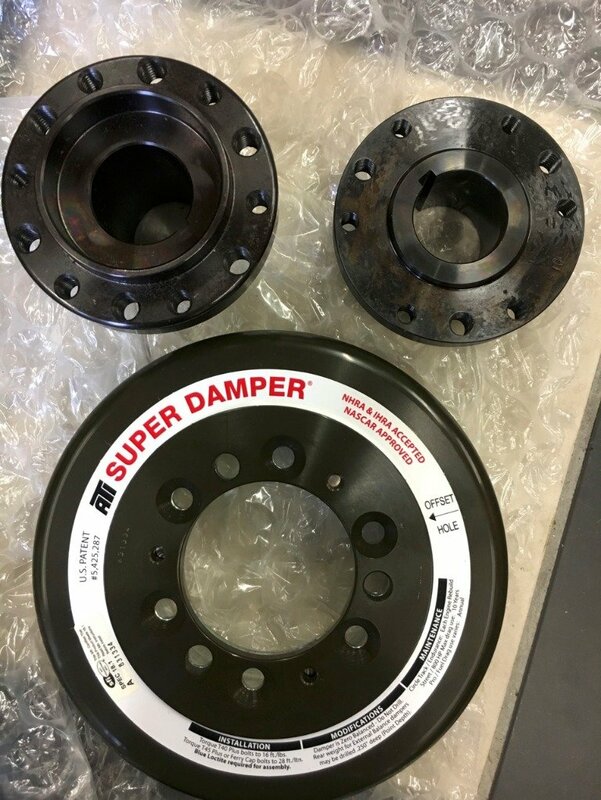 Perfect for the Ford BB. Tried on oil pan and it wouldn't sit down at the front of the block. 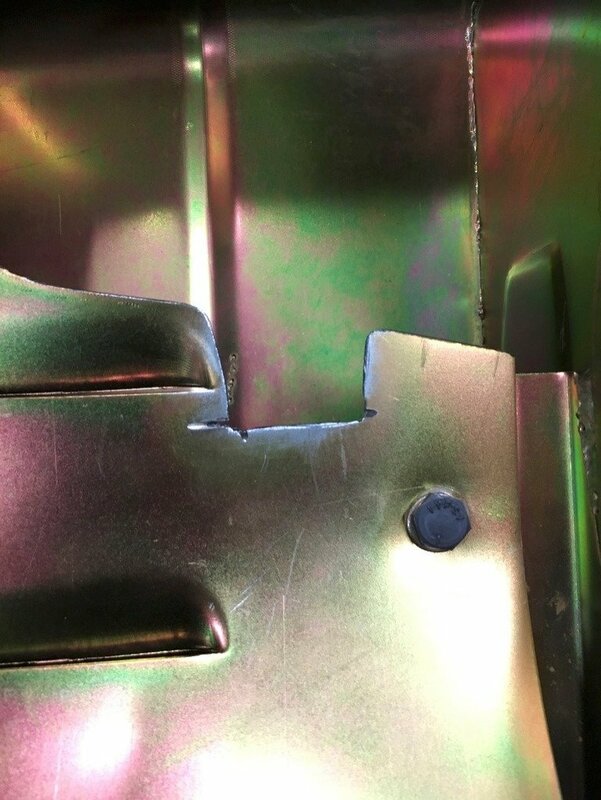 It was the windage tray fouling the new pump brace! Re-bent the brace. Just got clearance for the crank weight. Still had to relieve the windage a little. 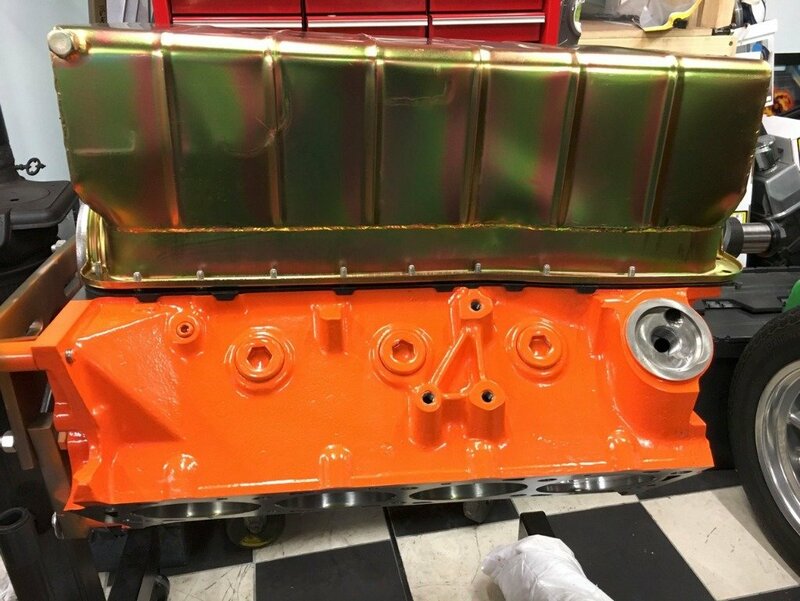 Oil pan now sits flat. 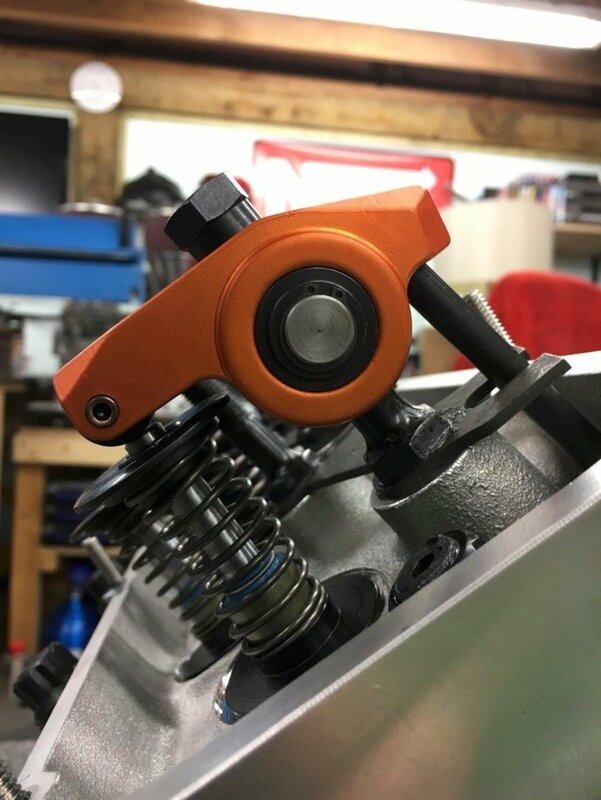 I cant actually go any further now until I get the bronze thrust plate sorted as I need to fit the timing chain cover before I can button up the bottom end. 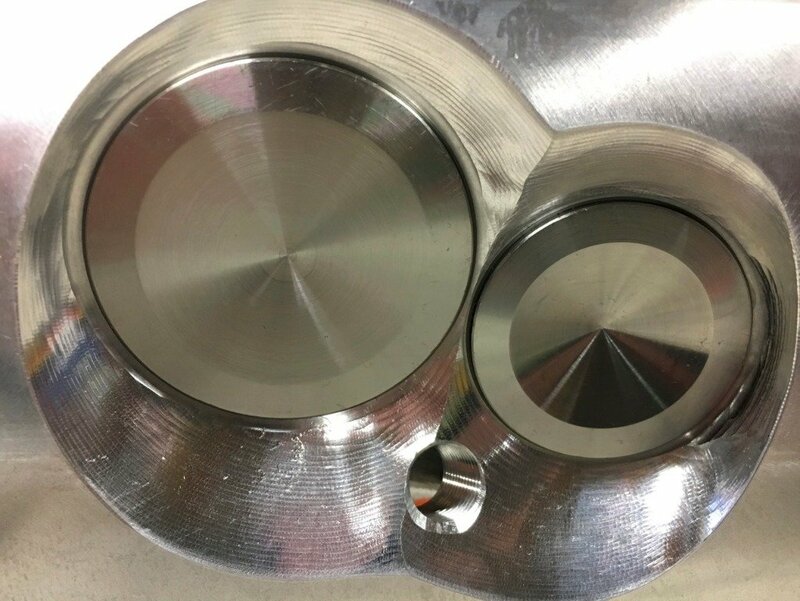 Got a top chap sending over the thrust plate I need, should be here end of next week. 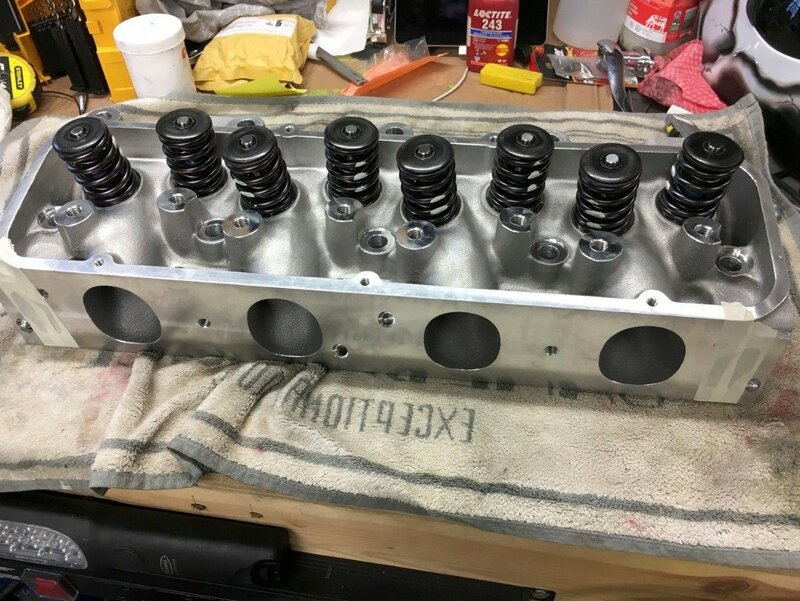 CNC'ed 72cc chambers, Manley stainless valves. Now found out I need the head locating dowels for both sides. More little stuff to order. The spark plugs recommended for the head are Autolite AR3924s. Got a cost to import, £8.50 each!!! Last edited by fabphil; 10-02-19 at 06:23 PM. Just realised I posted the pic in the wrong thread. 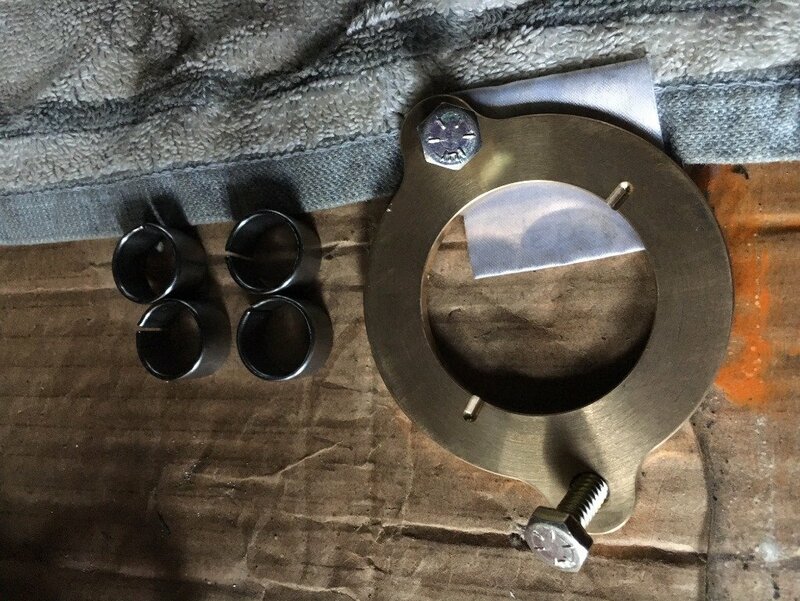 The bronze cam thrust bearing and cylinder head locating dowels have arrived so I can get on with the engine build now. 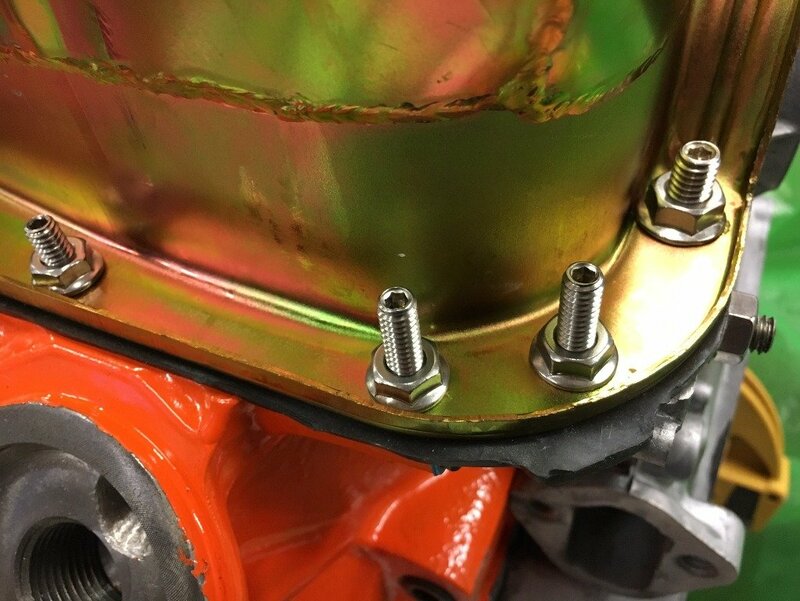 Fitted lifter oil gallery plugs. 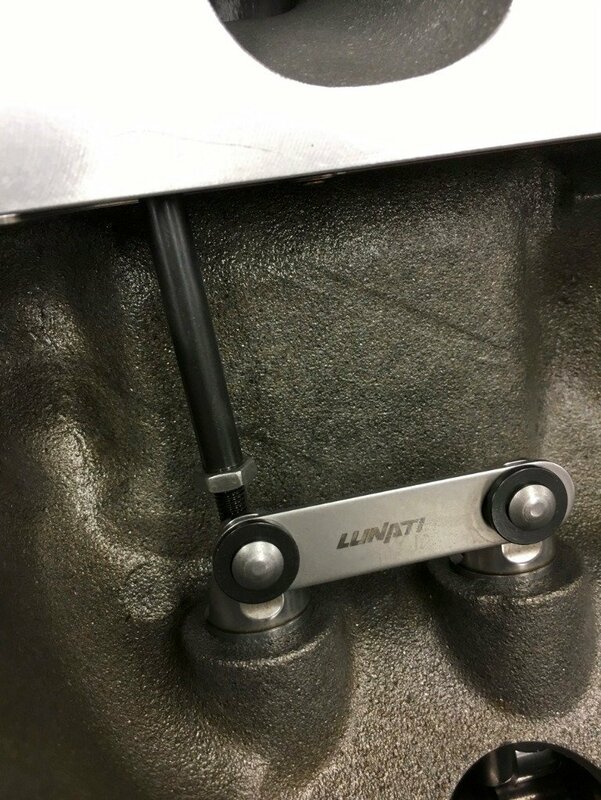 The plugs in the front of the block have a taper on the back, a flat backed plug would cause a restriction in the oil way behind the LH one. 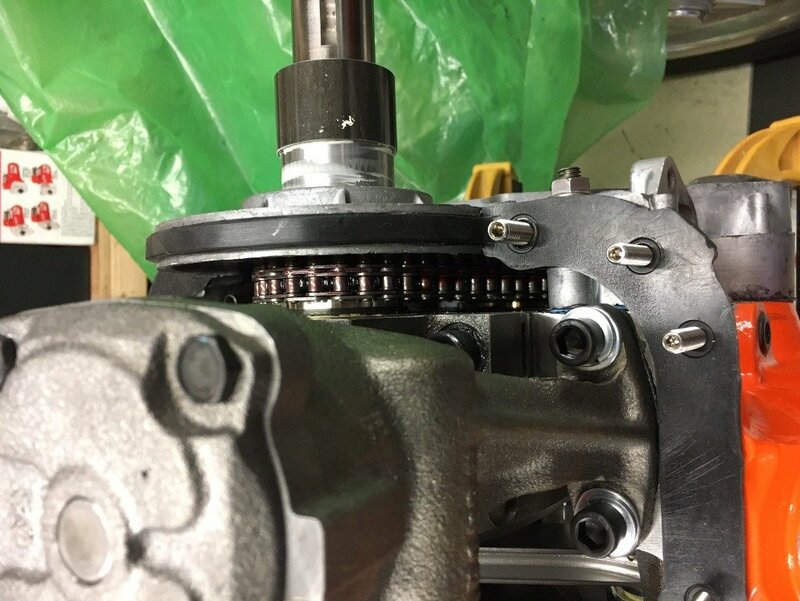 Installed timing chain cover, forgot to take a picture of the timing chain in place. I didn't forget it. 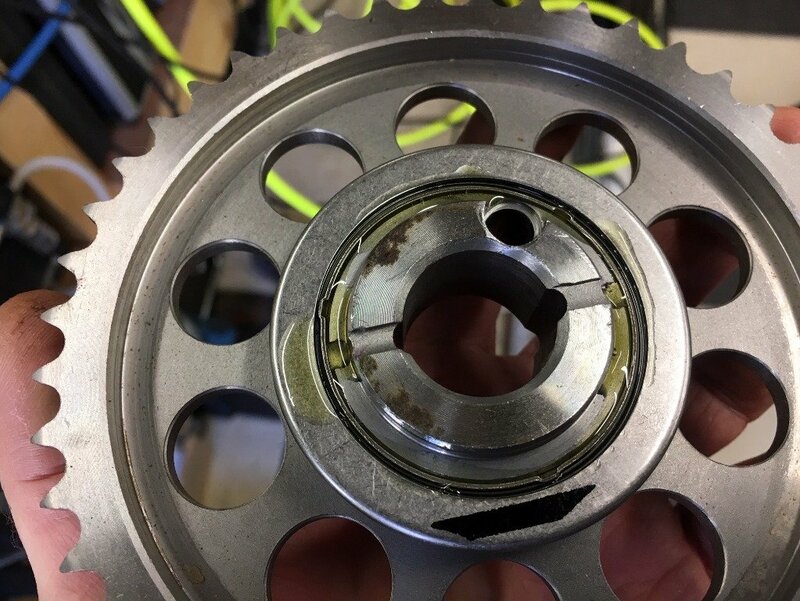 Cam sprocket is held on with a 3/8" ARP bolt and extra thick washer. 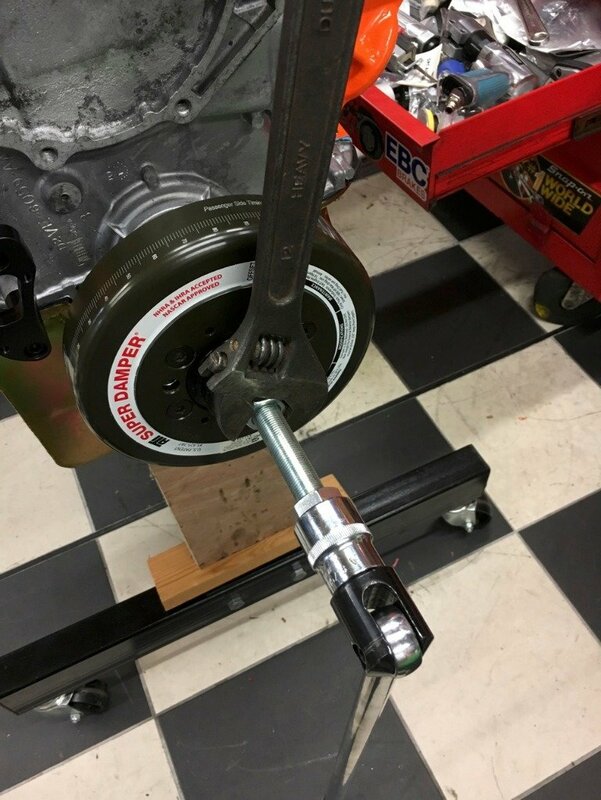 A common mod in the States is to have the cam drilled and threaded to 7/16" then use a Chevy crank bolt and washer to hold the sprocket in place. Fitted one piece pan gasket over chain cover. That's not blood on the floor, the timing chain was soaked in Comp Cams installation fluid (bright red) before fitting. The clamps are there as I suddenly realised I don't have any 4" x 5/16" bolts for the top of the timing cover. 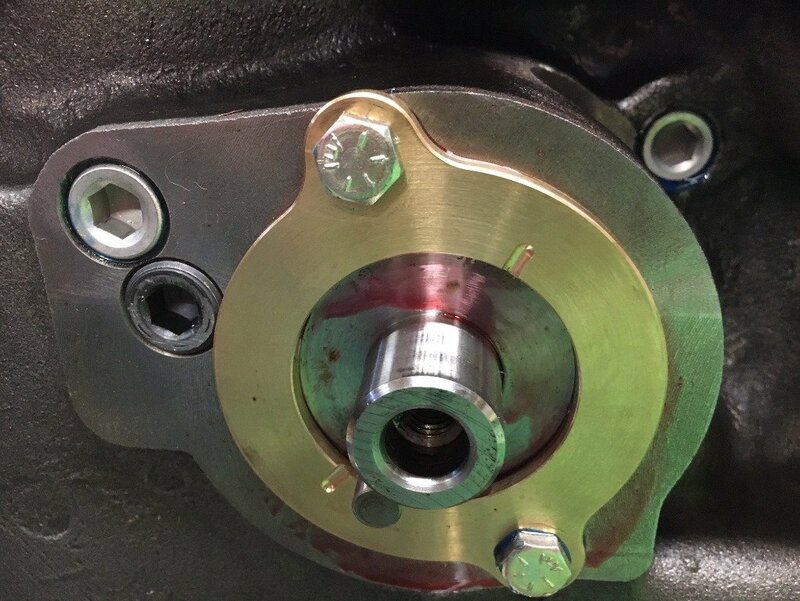 The crank spacer was fitted with the chain cover to centre it properly so the oil seal is sitting evenly all round. Have got the woodruff key somewhere. Am just waiting on a hub for the ATI balancer. 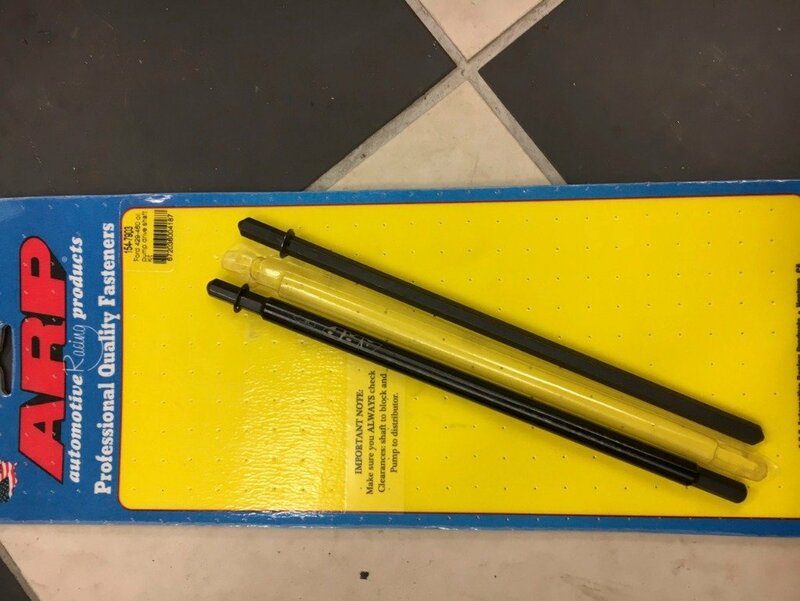 The one that came with mine has a 3/16" key way I need a 1/4" key way. 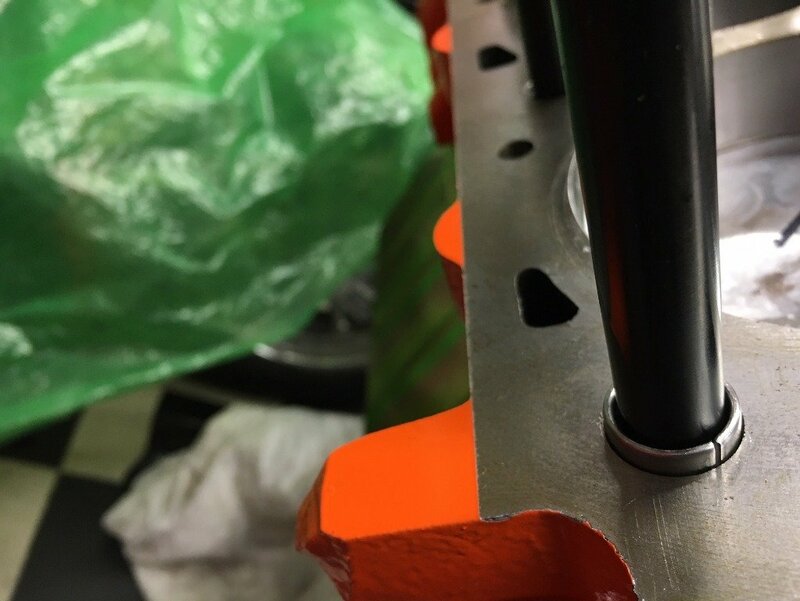 Installed the cylinder head location dowels. Buttoned up the bottom end. 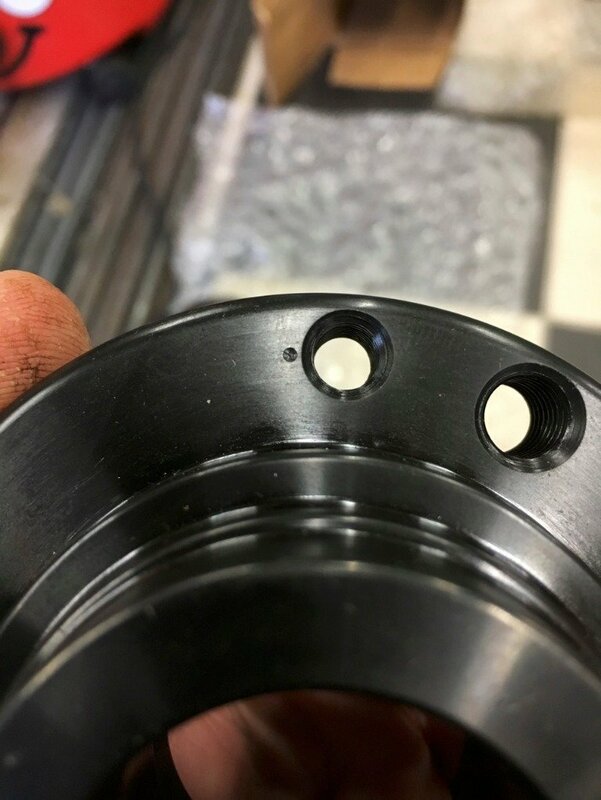 Nice stainless studs from Canton. 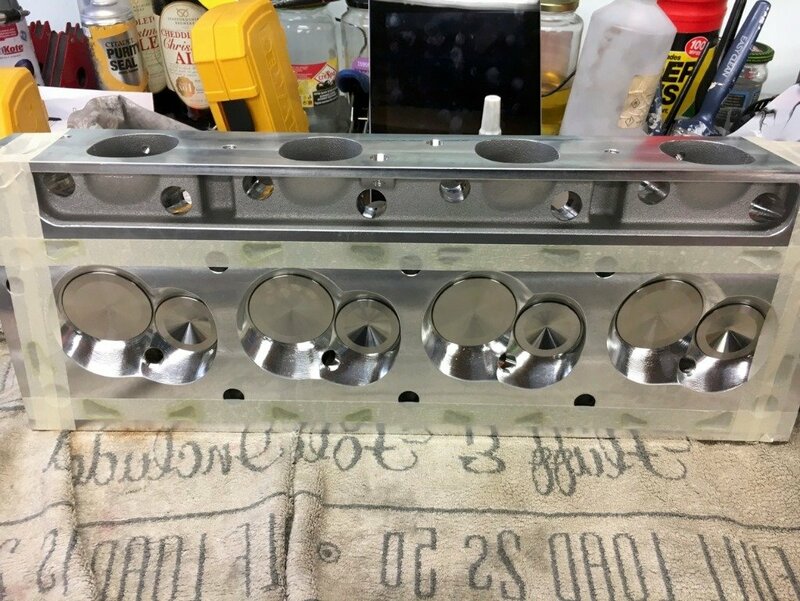 Installed the Cometec multi layer stainless steel head gaskets. Then got called in for tea...more soon. Last edited by fabphil; 28-02-19 at 03:05 PM. Never heard of the head gasket you are using. Can you give me some info on them, please. 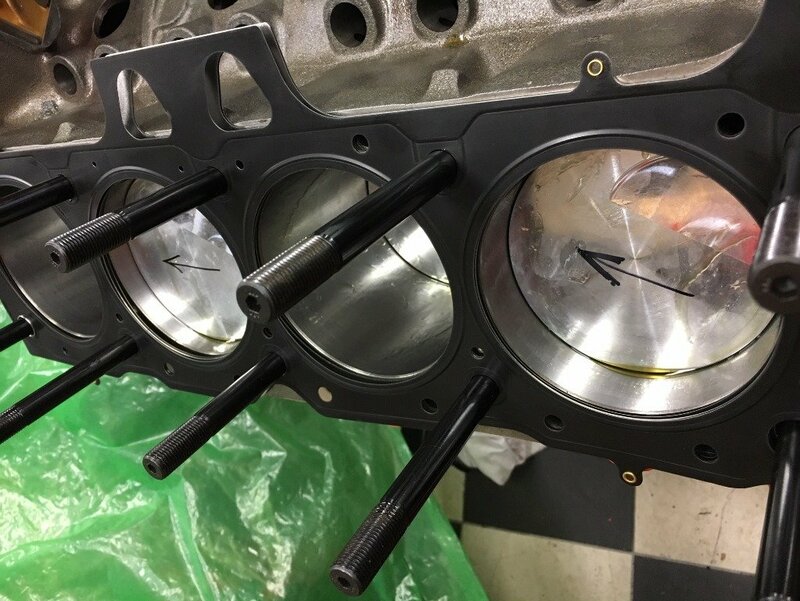 They are a multi layer head gasket. Mine are stainless. The two outer parts have a coating on them that seals against the head and block, they can be reused. The middle layer comes in different thicknesses. They are a little pricey though. Available from Performance Unlimited in the UK. Thats looking real good - those heads are pretty! The new ATI hub (on the right) arrived on Friday, big thanks to Marc at Performance Unlimited for sorting that out. Did the usual bloke thing, fitted it together....none of the holes lined up. 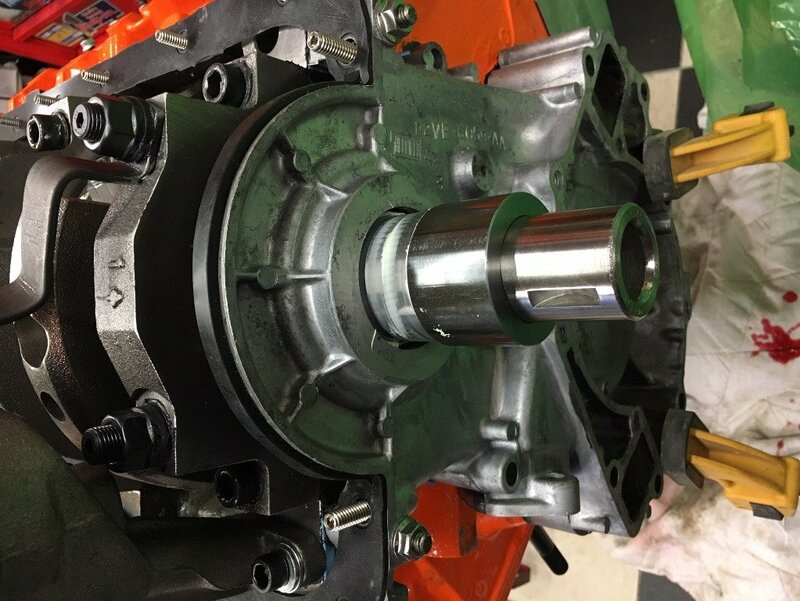 Got the original hub back out, none of the holes lined up! 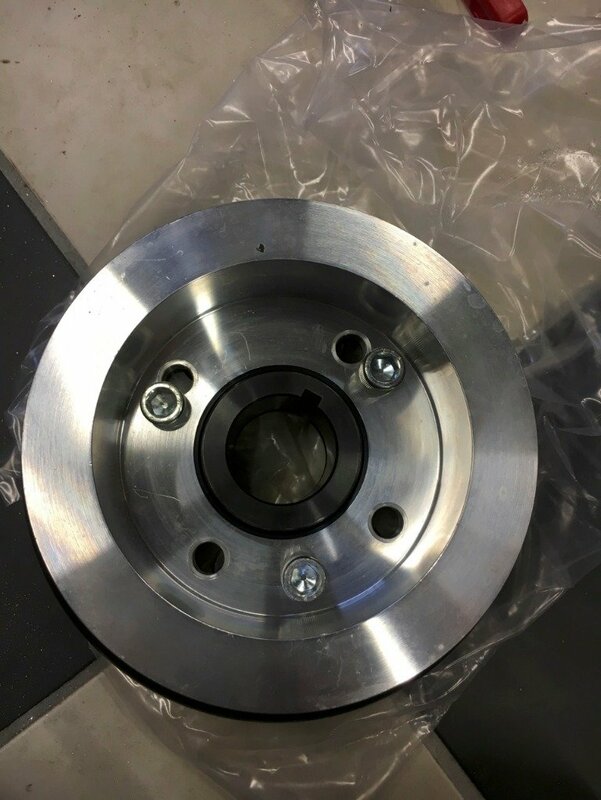 Spent half an hour faffing around, then read the instructions.There is an offset hole in the balancer for alignment purposes and the correct hole in the hub is marked with a small dot. Found the dot, things still didn't line up. Then turned the hub round! all 6 holes suddenly fell into alignment. 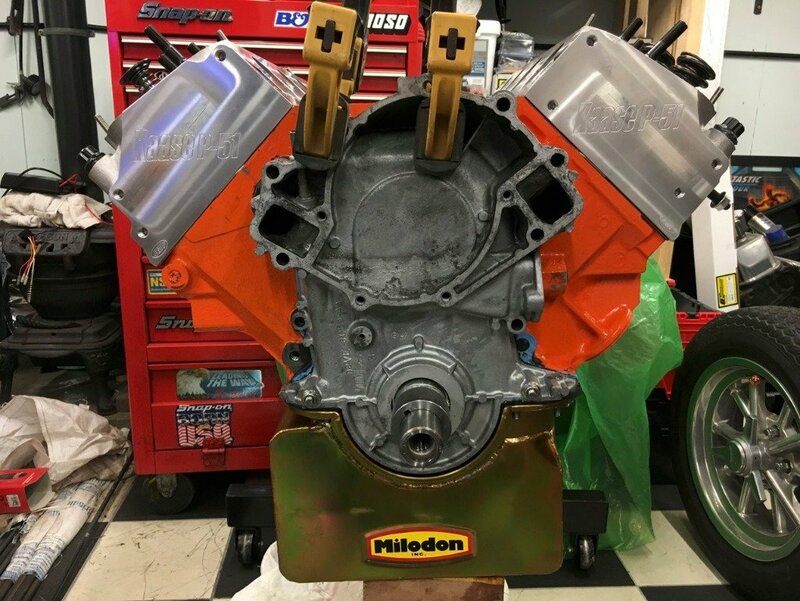 Fitted the 6 screws..instructions say these are not normal Torx screws use a T40 Plus bit...don't have one of those so has to visit our favorite auction site. Altogether just need to torque up the screws. 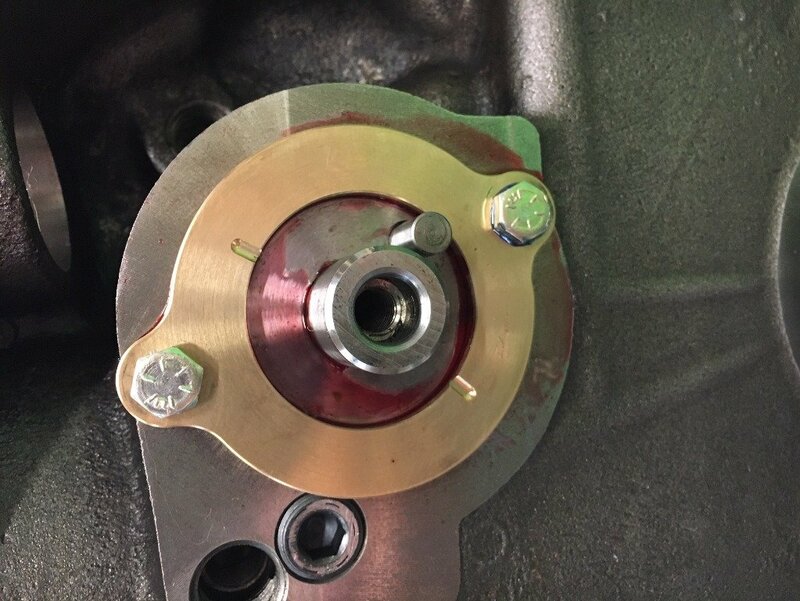 The new balancer has a 3 hole nounting for the front pulley not 4 like the old motor. So had to drill new holes in the ally pulley. Got the heads in place. Excuse the clamps. once torqued up I can check the pushrod lengths. 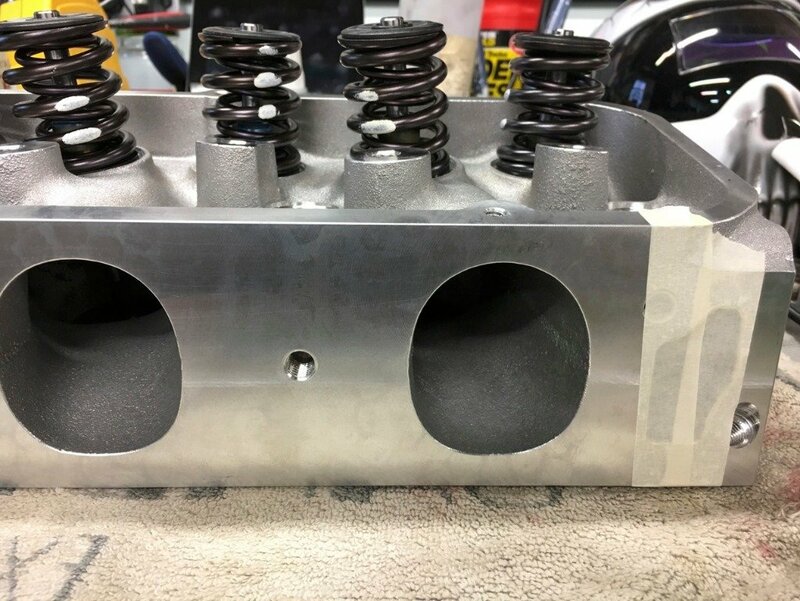 Evidently Ford engines over 500cu in are known as Elephant motors. So we have something rare in the garage....an Orange elephant! Last edited by fabphil; 02-03-19 at 08:54 PM. 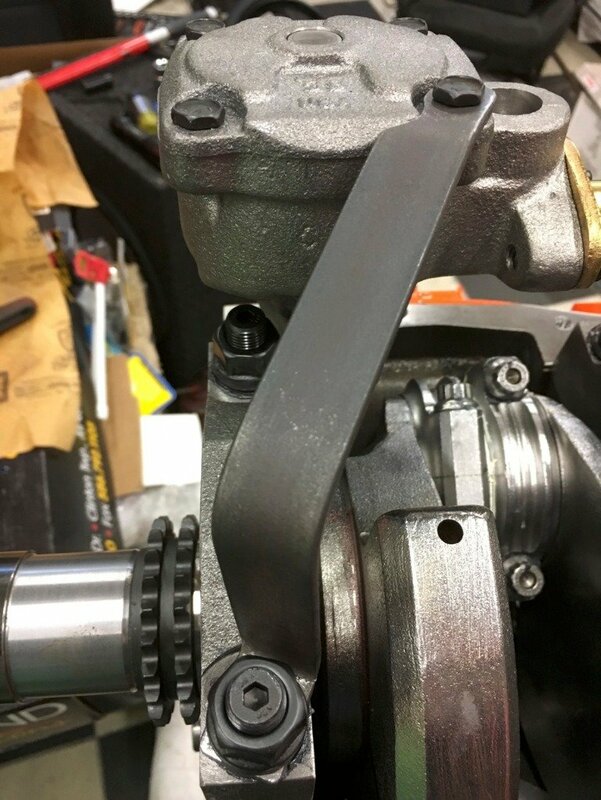 Dropped in the new ARP oil pump drive shaft. It a bit bigger than the Ford original. Then thought I may as well fit the balancer. 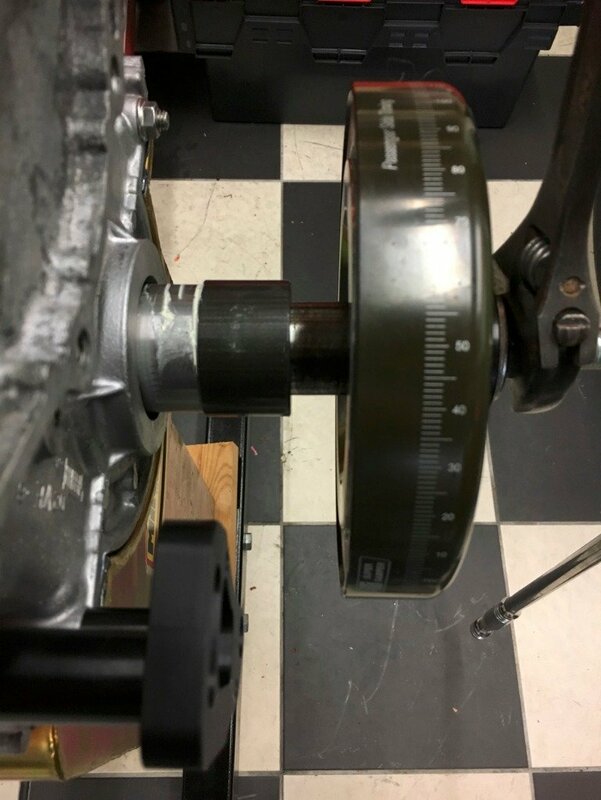 5/8" UNF rod was installed in the crank bolt hole. Balancer was slid on the rod and a thick washer and nut run up to it. 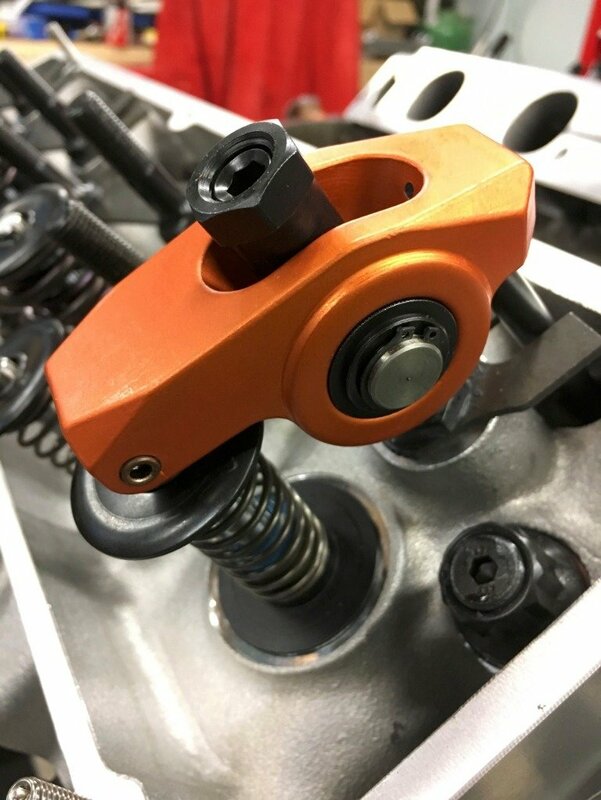 Two nuts locked on the end of the rod to stop rotation. All was going to plan until the balancer got half way on then stuck solid!!! Can't move it on or off even after applying heat. 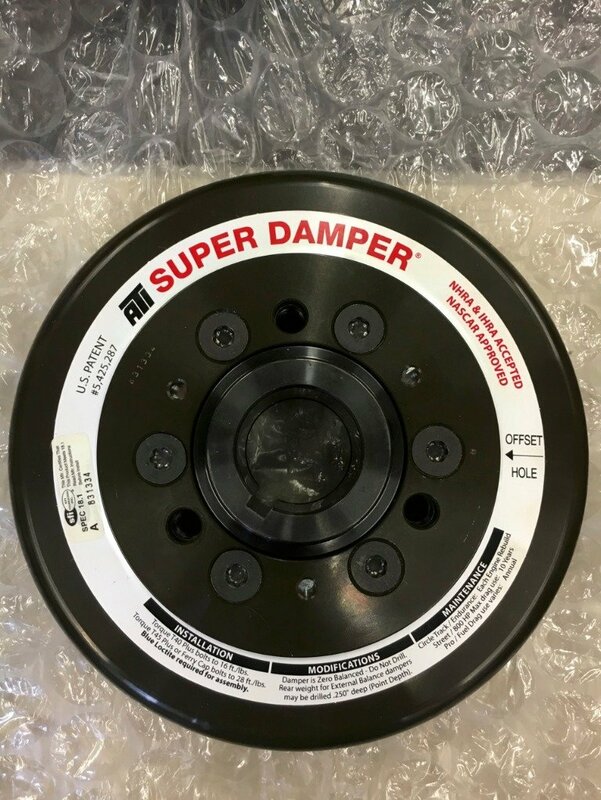 Now waiting for a balancer puller kit to arrive. Moved on to something else. 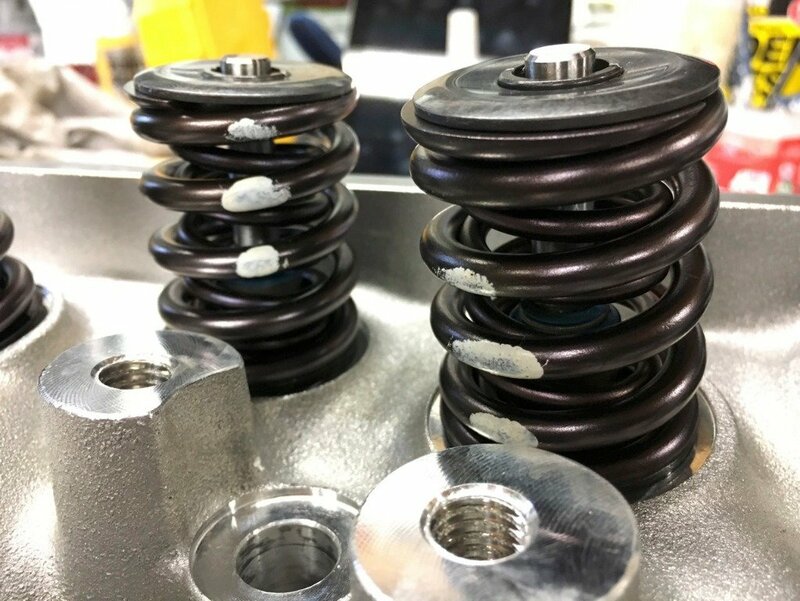 Now the heads are on I fitted a couple of light weight springs to cylinder 1 valves and checked the length of pushrods I need. 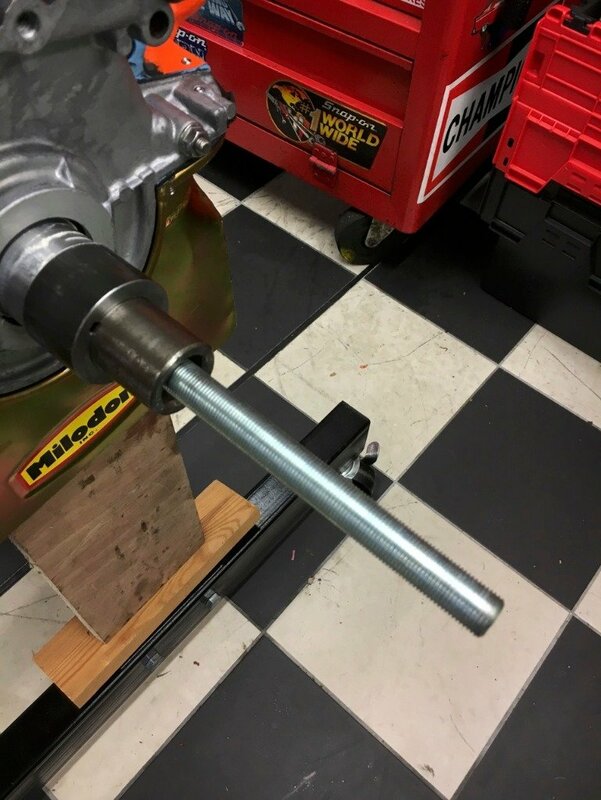 Placed new roller lifter in the holes and got out my adjustable pushrod. 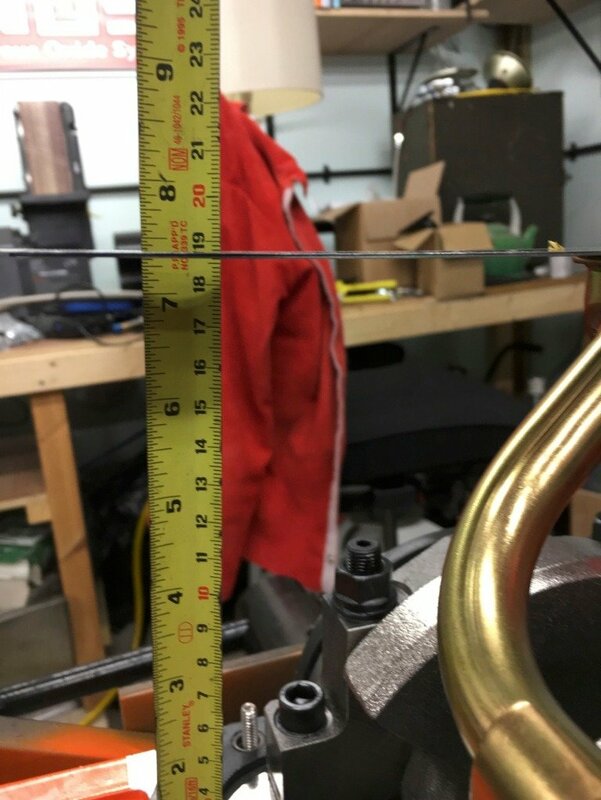 After setting up the rocker at 90 degrees to the valve retainer and doing the various tweeks the rod length came out at 9" for the inlet and 9.191" for the exhaust. 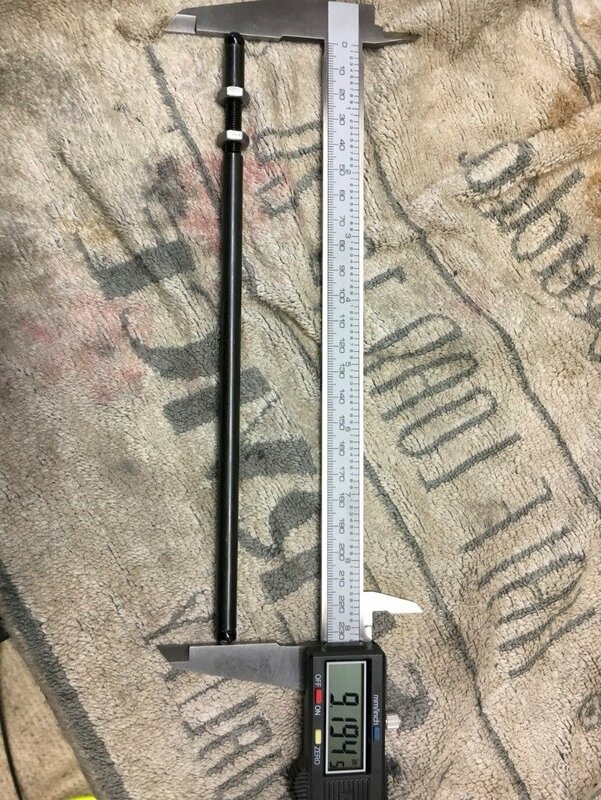 Will now be ordering some 9" & 9.2" Manley 7/16" rods.....more waiting. Last edited by fabphil; 05-03-19 at 11:00 AM.